Andrea's World Reviews: SPRING FLING! Bean Bag Chair Outlet Review & GIVEAWAY!! SPRING FLING! Bean Bag Chair Outlet Review & GIVEAWAY!! The moment you've all been waiting for has arrived. The Spring Fling Blog Pop event is upon us. If you don''t know what that is or have not been anxiously waiting for it's arrival, that is a serious problem that, luckily, I am here to rectify. Spring Fling is an event tat is hosted by myself and 10 other fantastic blogs. It is 4 days long starting today (April 9th) and ending on Saturday(April 12th). Each of the 4 days all 11 of us will each be posting a new giveaway(and review) on our respective sites, and there is a linky on each site(just go to the Spring Fling tab) that will bring you to all of the incredible giveaways. All of the prizes are out of this world cool, so you are not going to want to miss any of them. Are you excited yet? I know that I am, so let's get down to the fun part. I decided to kick of the event with one of the hottest giveaways for our last Blog Pop Event. The Bean Bag Chair Outlet is back with an even bigger giveaway! The giveaway will be for a GIANT XL Royal Sack! I had the pleasure of reviewing this, and it is every bit as fantastic as I had hoped it would be. After reviewing the Large Royal Sack over the holidays, I already had a pretty good idea of what to expect. I new the quality would be superb and the comfort would be outstanding, but the size is even bigger and more impressive, and this velvety chocolate brown cover is so gorgeous. Another thing that did not surprise me in the least is that my kids, especially my daughter, love it. 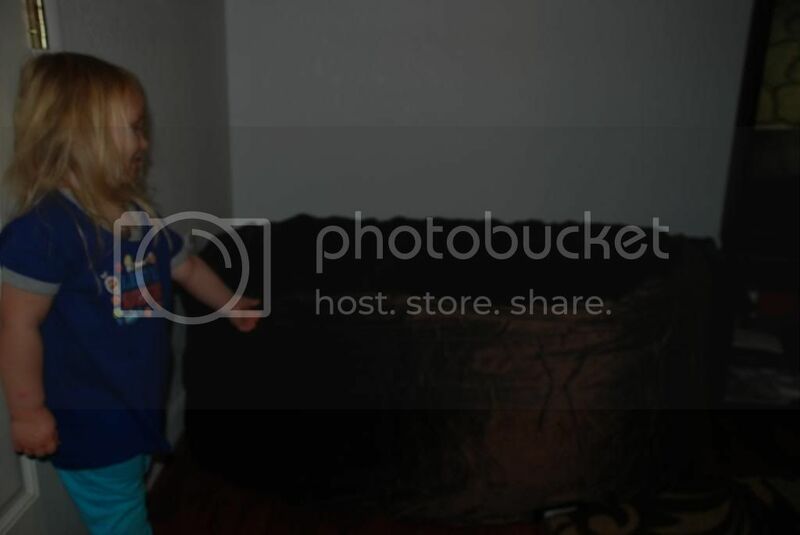 My little girl immediately claimed our first Royal Sack, and this one quickly followed suit. As soon as she laid eyes on it, she claimed it as her own. "Tina's beanbag" she proclaimed, and proceeded to put her new possession on display(as if she was modeling it), and proceeded to lounge in it as well. I can see why she loves it so much, it is seriously comfortable. If it was a little longer, I'd probably sleep in it. I know that she could, and probably would if I let her. Any kid would love to have something so grand to call their own, but the XL Royal Sack is really a treat for the whole family. Not only will each individual member love to get cozy in this, it is perfect for increasing family togetherness. My husband or I and both of the kids can cuddle in this all at once. It is perfect for Story time or movie night, and hubby and I like to watch movies together after the kids go to bed. The XL Royal Sack makes any seated activity better. When miss Diva allows me, I love to sit in the Royal Sack as I type up my reviews on my laptop. It certainly reduces my back pain that other seating frequently causes me. None of us can get enough of the XL Royal Sack, and I love how gorgeous it is. It matches my couches, rug and decor, and goes great with my large Royal Sack as well. It is like an accent piece and visitors are always commenting on it. Whether you are looking for a cozy family time spot, a throne for the man or woman of the house, a kids dream come true, a beautiful decoration or a mix of all of the above, the GIANT XL Royal Sack is perfect. That is why I am so excited to give one of you lucky readers the change to win one. Just enter below for your chance win this incredible prize. Good luck! And be sure to check out all the other giveaways HERE. i love the size of it! perfect for cuddling. The look of it is perfect! Goes with most any decor. I love the size and the colors available. I love how huge & soft it looks! It seems like it would be the most comfy place for my little ones to read or watch tv and we can easily move it from room to room! That is really huge!! That would be very comfy and roomy. I like that it is super sized and both my kiddos can sit on it at the same time. The size is great and so is the brown color. I like the size the most! This would fit prefectly in my day room. I could read a book or nap in luxury. IT's soooooooooooo fluffffyyyyy!!! My kiddos would love it. I love that it is versatile for all occassions and can help reduce back pain! I like that it is big enough that both of my boys could sit on it and still have room. I like the size and the fabrics available. I like the size and color it looks huge! I love the comfort factor! I like how comfortable it looks. it would be big enough for my daughter and i to watch a movie. I love how large it is and the fact that both my kids could use it maybe without fighting?! I think it would be perfect for reading books together before bed with my kids! It looks and sounds so comfy! I love how comfy it sounds and the color palette. I like how HUGE and comfortable it looks! I like that I would actually fit in it, lol Being heavy isn't always the best for seating arrangements! I like this bean bag because it looks so darn comfy! It looks so comfortable and I know my kids would just love to use this and NOT get out! I like that me and my son can sit together. He complains about the recliners we now because he can't snuggle when er're watching TV together. I like that it looks really really comfortable. Haven't sat in a bean bag chair in 30 years. I remember how nice they were. I like that it looks really comfortable and I size I could enjoy relaxing in. My friends had one like this - it was so comfy! and great for chats and cozying up with a book! I've always wanted one - thanks for hosting the giveaway! I love this chair because its big enough for me, my son and my pup to hop on and relax on. I love the size. Room for more than one! I like that it can be shaped different ways. I love the XL part, it's so big and looks so cozy! alona y.
this is big, the shapes are different and I could use it myself! I love the size and comfort of these! It would be a perfect place to sit and relax or study. I love bean bag chairs! They are so comfortable! To have an x-large one would be awesome! I like that it can reduce back pain and that it's large enough to fit several people. I love that it looks so comfortable and both my kids could fit on it! I like how comfortable it looks as well as how large it is. I love the size and the ease of comfort! I like all the different cover options and that its made well. I like how big it is too. I like that it looks big enough for all 3of my boys to sit on at once. I love that it could possibly ease my sciatica pain when sitting! 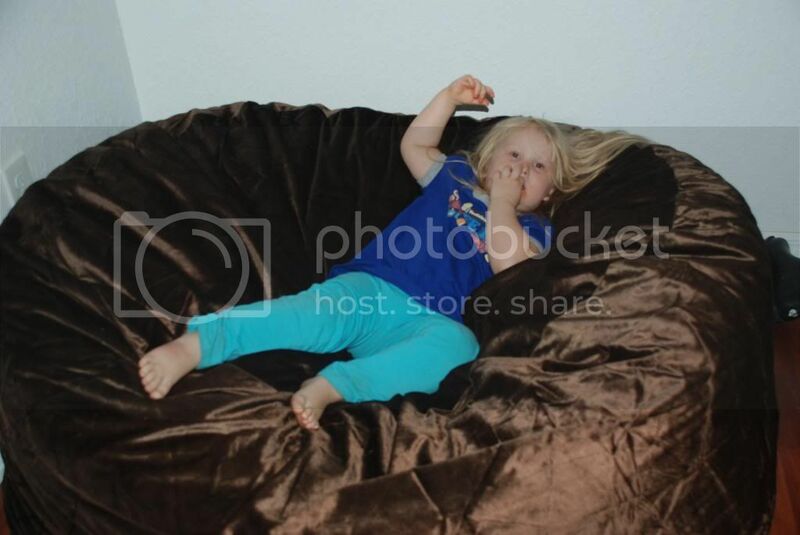 I like that the Bean Bag Chair is large. I like that you can change out the cover for easy cleaning. I like it's big size! Honestly the size seems perfect for my 2 littles. But I like all of the fabric color options on their web page too. I would love the camo fabric. I love that it is HUGE enough for me to snuggle with my little one on!! It looks more comfortable than my steel chair. I love the size of it! Awesome! i would love it because it would add extra seating without having to get another piece of furniture! This could come and go as we would want or need it to! comfy seating is a must, & this looks extremely comfy! I love the color availability. We can all fit in it! Like you said, it would be great for both of us to sit in it and watch movies! I like the size of it. Perfect for the two of us to watch movies. I like the size of this bean bag chair. It is large enough for two. I like that it would go with a variety of living room or family room decor. Thanks for the chance! I like that it looks so soft and is sooo big! I like that it's a good size and comfortable! I like the size. Perfect to snuggle in! I like how big it is! I like how big it is and keeps its shape! I love that it is big enough o snuggle with the kids. I like how comfy it looks. I like how relaxed and cozy it looks! I love the size-That it could hold all of my family! for me, its the size of it. 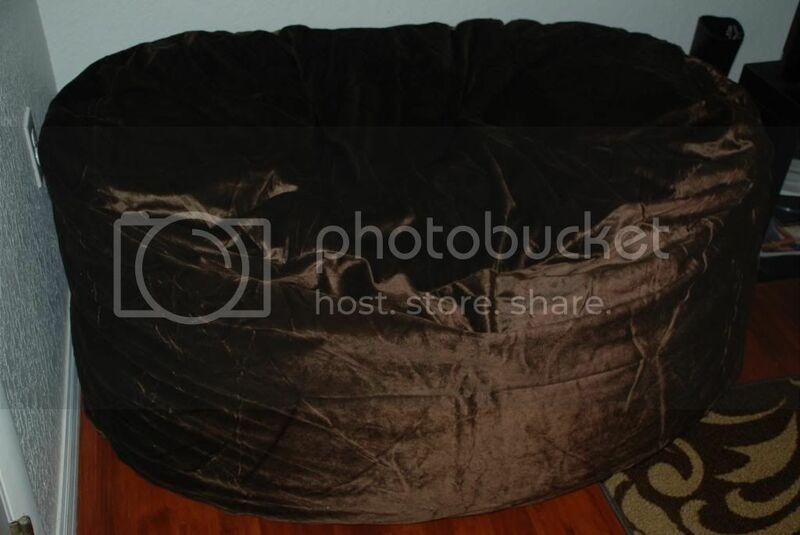 I love hanging out in a bean bag chair, and this one could accommodate me and the cats or me and my daughter easily. Plus it sure looks well made and sturdy enough to handle time in front of the TV with the grandkids and my daughter watching movies and playing video games. I really like that it looks comfy and that it would be fairly easy to move from one room to another like from the bedroom for a bedtime story to the living room to watch tv. I love that it has a great size and can pick colors that will match your room. it's big and comfy , way cooler than a normal love seat, and both of my toddlers would absolutely love it! I love the size of it. My girls can share it. I love the massive size and it looks so comfortable. I love the size. It would be just my own comfy spot! I love that it would be big enough for my husband and i together!! I love that it makes a perfect spot for my kids to sit and read. It looks so comfortable! I'd love to relax on it and read. I like that it's big enough for parents too! I like the fact that it would stand up to the abuse of 3 kids. All 3 would want to sit on it at once.